It’s over month and half now since the curtain fell down for salmon season 2018 in river Tornio. Weathers are getting colder and soon we will see snow covering the river valley and freezing of the river. Salmon and sea trouts have spawn lately in the gravel bed of river and we hope they did good job this Autumn so we will see plenty of hatching parrs next spring! After salmon season there is always still lots of work to do. We have drive all the boats out of the river, clean and wash them and lift them to our garage to wait for winter. There is also always need to take care of the fishing gear, clean them and check everything is working before store the as well. Engines are very important gear to take care and maintain properly. Since we have many cottages and two downstairs room of the main lodge, there were cleaning of accommodation to look after as well. Now it seems that we are ready to reach the winter. Looking back to salmon season makes me feel mixed emotions. The start of the season was promising, because the run started quite quickly with decent numbers of big fish. Spring flood went off quickly and first two weeks or so conditions for the boat fishing were great. For the fly fishermen the low water level of the early season wasn’t the best thing. After first two weeks the water level kept dropping and it started to affect boat fishing as well. Salmon were running quickly and the normal good fishing positions weren’t working like they’ve used to. Still the first three weeks were pretty good for the boat fishing, but quite tough for the fly fishing. Super early chrome from the June! The main run of fish in river Tornio is usually after the Midsummer and until the Mid-July. However it seemed to be missing this year. Was the reason over-fishing in the sea, low water level or heat of the July, is hard to say. Maybe combination of those and maybe some other things too. We have to also remember that there is always variation in the nature, so every salmon year is a bit different to one another. Anyway we felt that those fish who were arriving after Midsummer kept high pace and didn’t stop as much as usual in our home pool, while some other fish apparently waited their arriving to upstream (according to scientists) maybe as a result of the extremely low water level and the warm weather of July. 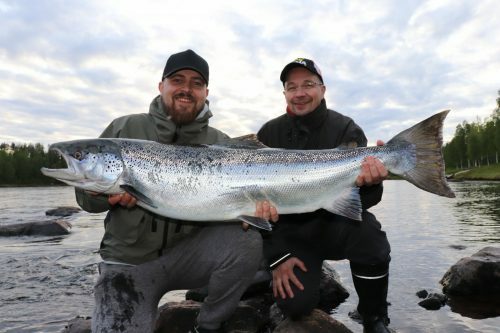 Whatever the reason for unusual salmon run of the Midsummer, the fishing was hard and get even harder during the July as the water level went higher and higher. Still there were few good nights and even one pretty good fishing week during July. The trick was to focus the night and early morning fishing with small flies. We also saw decent amount of fish running during late July, which helped the fishing. Suddenly the whole picture of the season changed coming to August this year. Weathers changed quickly and river valley experienced few very cold nights in the first days of August. Water temperature dropped soon from 21-23 degrees to near 15 degrees and all of a sudden there were eagerly biting salmon all over the river! Water level raised a bit and it made the fishing even better. The last Month of the season offered really good fishing overall with both fly and boat fishing. During hard temperatures there weren’t many fish caught in July so that might have affect the fishing in August. This year we had a great run of grilse (1-3 kg salmon) too, which were biting very well to flies and wobblers. But yeah, as a summary we had strange season with decent June, slow July and very good August. The total number of migrating salmon to our river this year was 46 652 individuals. That’s some 6000 salmon more than last year, but far from the top numbers of 2014 and 2016, when river produced 100 000 migrating salmon. During coming weeks we will analyze a bit the best flies and lures and also fishing techniques of the past season. We will also give our view for the coming season and the future of the Baltic salmon. Stay tuned!